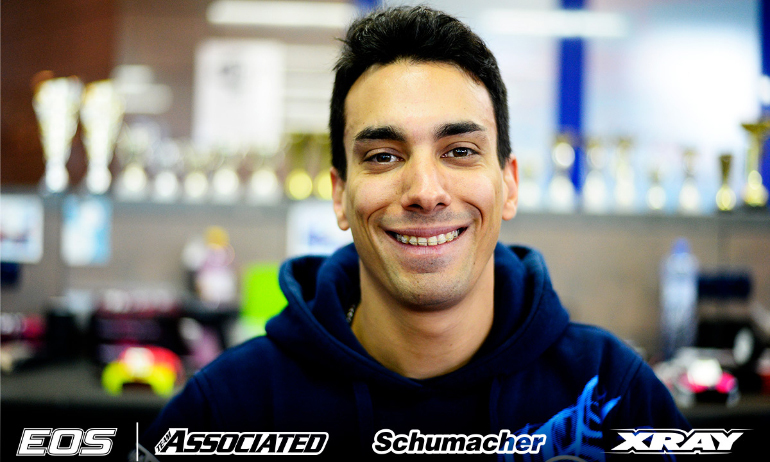 Bruno Coelho has finally delivered on his top seeding by taking the penultimate round of 4WD at EOS Slovakia but it was far from a perfect heat for the Xray driver. With Daniel Kobbevik setting the pace, the young Norwegian would get the table top wrong with his car crossing the track and into the path of his team-mate costing Coelho over 3-seconds. 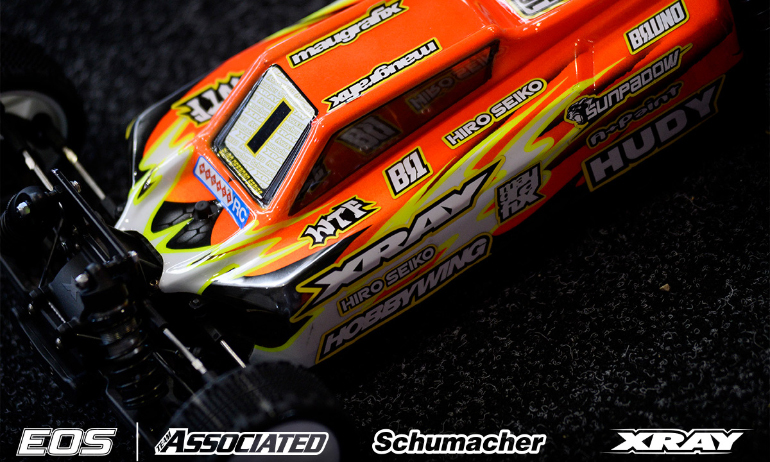 This put Lee Martin to the front before his Yokomo performed a back flip on the main straight and a short time later a bad landing on the table top led to a broken front arm. Now it was Joern Neumann, with two P10 runs from the opening two qualifiers, who was top of the timing screens but Coelho was on a hard charge back from his earlier incident snatching the TQ on the last lap as Neumann had a bad lap. Behind, Orlowski would complete the Top 3 as he struggled on his 3rd run tyres while Martin Bayer struggled on new tyres but ended up P4 3-seconds back on his TQ’ing team-mate. 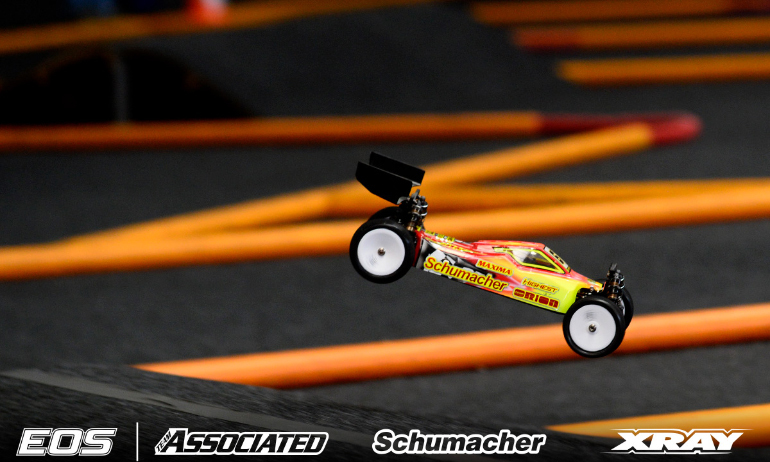 Commenting on his TQ run, Coelho said, ‘Everything was going right this time but then Daniel (Kobbevik) came across the track and I lost 3-seconds. For a moment I could see everything going wrong again but I forced to the end. As I expected the car was working very good, I had no mechanical issues, and at the end I could do enough to TQ the round’. 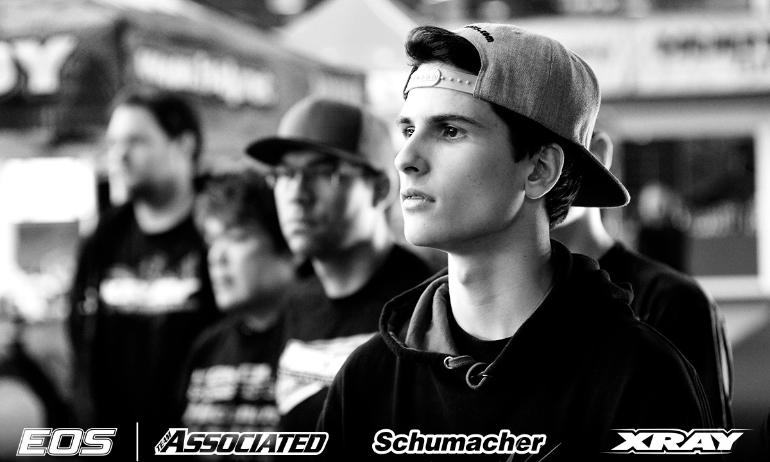 Looking to the final qualifier he said, ‘I have already accepted starting 2nd. On new tyres our car is too aggressive. Martin was on new tyres that time and he didn’t have as good a run as before. I will use the next one to break in the tyres for the final, if I can make the TQ it would be good for sure but the important thing is to get the tyres ready for the final’. ‘This time was the first time the car was good’, was Neumann’s reaction after making a huge improvement. The Schumacher driver continued, ‘Before the car was very edgy but now it was now smooth like normal. We couldn’t find the issue so Trish rebuilt it and now it was good’. Using his second set of tyres in Q3, the multiple EOS Champion is looking to end qualifying with a strong finish. He said, ‘I will push it in the next to try and start 3rd or 4th but maybe I can get second if I TQ (the round). We will see’. On his lack of pace Orlowski said, ‘It was the third run on the tyres and the car felt very bad because of the different tyre wear side to side. We will check over the car to be sure it is the tyres’. He continued, ‘I knew some guys were going on new tyres but I was hoping Joern would take the round. It’s frustrating he lost it on the last lap’. Chasing a clean sweep here at the Hudy Arena, he said, ‘I have new tyres for the next one but I guess Bruno will too’.